Last weekend was a difficult one for all of us. The one year anniversary of the shootings at Sandy Hook Elementary brought up emotions and memories that painfully juxtaposed against the normally joyful holiday bustle. Images of angelic faces and devastated families swirled around me all day. But I didn’t need a reminder to be thinking of the Sandy Hook community, because I haven’t stopped thinking about them. I don’t think any of us have. It’s like the whole world has reached out our arms to give one big giant hug to the grieving. I hope they feel it. My community, also a “small Connecticut town,” organized an event that encouraged the lighting of luminaries on December 14th. We participated and I found the experience very soothing. With my oldest, who is aware of some of the details of the tragedy, I slowly scooped sand into 26 bags. As we carefully placed in tea lights, I brought up specific names as their faces flashed before me. Snow was falling as we placed the luminaries outside, and I lifted up my face to feel the tiny pings, the gentle reminder of the cycle of the seasons, and life. Snowflakes have become a symbol of hope and healing in Newtown, CT, and I like to think that maybe it wasn’t a coincidence that it was snowing in CT that day. 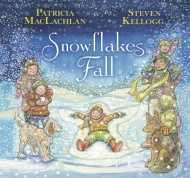 “In Snowflakes Fall, Newbery Medalist Patricia MacLachlan and award-winning artist Steven Kellogg portray life’s natural cycle: its beauty, its joy, and its sorrow. Together, the words and pictures offer the promise of renewal that can be found in our lives—snowflakes fall, and return again as raindrops so that flowers can grow. MacLachlan and Kellogg, who are longtime friends, were moved to collaborate on a message of hope for children and their families following the tragic events in Sandy Hook, Connecticut, on December 14, 2012. Kellogg lived in Sandy Hook for thirty-five years—he raised his family there and was an active member of the community. With Snowflakes Fall, they have created a truly inspiring picture book that is both a celebration of life and a tribute to the qualities that make each individual unique. Nancy Tandon • This entry was posted in Acts of Kindness, Illustration, Picture Books and tagged Patricia MacLachlan, Sandy Hook Elementary, Sandy Hook School Support Fund, Snowflakes, Steven Kellogg. Bookmark the permalink. I had no idea that this book was written for Sandy Hook. Thank you so much for bringing it to my attention! I just stumbled on this book myself. I love that someone who lived there for 35 years did the illustrations – feels right. And I’ve always enjoyed Patricia MacLachlan’s lyrical writing style. The two blend so nicely. Happy to spread the word. What a beautiful tribute to your neighboring community. 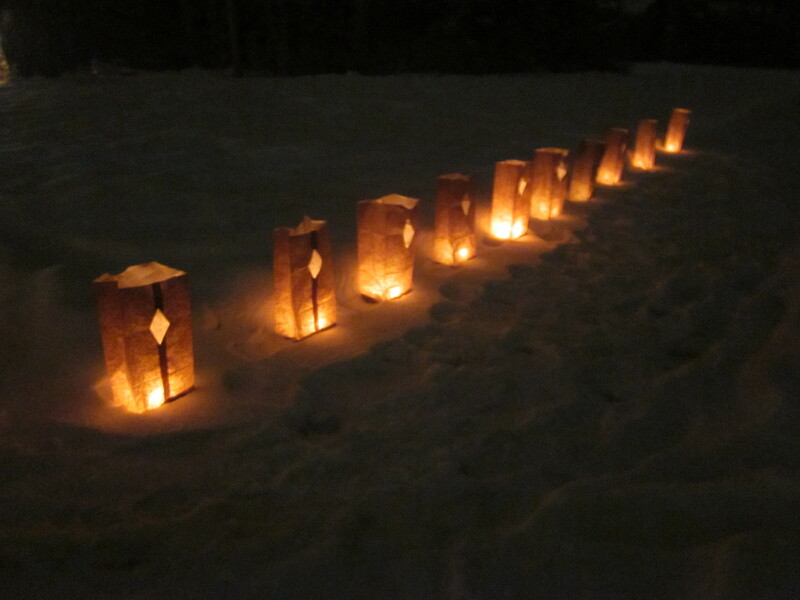 I love the idea of lighting the luminaries. And, I’m glad you shared the book because it really is beautiful and people need to know about it. Beautiful post! Thanks, Patricia. I thought of you and Children’s Books Heal when I read it. I think we’ll make the luminaries an annual event. This is a lovely post Nancy. Thank you. Thanks, Paula. Merry Christmas to you and your busy clan! You are a snow angel. Thank you for telling me about this book, Nancy. I will pick up a copy.